As I continue to adjust to being unemployed and am waiting to have a baby to take care of, I find myself getting a little…well, bored. I’ve painted all the rooms that needed painted and accomplished lots of projects around the house since June and have run out of things to fill my time. I did start a part time job in retail, which is great during the holidays but I’m only working like 15-20 hours a week and that still leaves plenty of time to be bored, especially when Eric is traveling as much as he has been this Fall, I don’t even have anyone to cook for! I decided to remedy my situation by making something for myself to do and throwing my first large dinner party. I think I can safely say that each one of these dishes was a hit and I was very proud to serve each one. My favorite of the night is a tie between the brussels sprouts (which is the only dish that came back completely empty) and the chocolate pecan pie. It was my first time making both of these recipes and they were both outstanding, not to mention easy. I was able to make the brussels sprouts while my guests were talking to me and having cocktails in the kitchen and the chocolate pecan pie was a cinch and came out so delicious. It might be my new favorite fall pie. Here are a few photos one of my guests was able to capture for me while the evening progressed (Thanks Mike!). My table set and ready for food, the mismatched chairs remind me of Charlie Brown’s Thanksgiving, though the table was not a ping pong table. Action shot of brussels sprouts and butternut squash soup. Pork being sliced. The apples and onions combined with a maple syrup glaze gave incredible flavor to this roast. I will be making this again, it was simple and so delicious. A sweet finish to a great evening, made even more sweet with homemade vanilla bourbon whipped cream. I wanted my harvest dinner to reflect the flavors of the season without using any Thanksgiving “staples” as a part of the menu. I think it was a success! I can’t wait until our next dinner party, I’m going to need to start writing down ideas! Are you all getting ready for Thanksgiving? Are you making the big feast or bringing a dish to share? Any suggestions you can share to make the day successful? Mine is, make as much the day before as possible, even prepping ingredients and get that table set so you don’t have to worry about anything like that as you’re putting everything together and visiting with guests. Lastly, I’m hosting Bean Chat for Gevalia Coffee this Thursday from 10am-11am. I’ll be discussing some food related topics on from their Facebook page. I’d love to see you over there so go to Gevalia’s FB page and “like” them, then on Thursday click on Bean Chat between 10am and 11am or join via Twitter chat. See you there! One of America’s favorite snacks is soft pretzels; one of the most recognized smells is probably the scent of Auntie Anne’s pretzels wafting by while you walk through the mall. Everyone has their favorite kind original, cinnamon/sugar, almond, cinnamon raisin, once those doughy creations are bathed in butter, they are impossible to resist. While visiting Germany, we had the chance to taste some “real” pretzels, you know, German pretzels. They were delicious and while they stayed more true to their roots (no cinnamon raisin flavors) they were some of the best pretzels we’ve ever had. When planning a German inspired meal for some friends I decided to try soft pretzels for myself. Let it be known, I am no bread maker, I’ve never made my own bread or anything close to bread. This was my first time using actual live yeast and allowing dough to rise. Honestly, I’m too impatient to wait for that normally but in this case I was cooking a bunch of other dishes so I had time to wait for dough to rise. The pretzel dough was very simple to make. First combine the water, sugar and salt. Sprinkle the yeast on top and allow it to sit until it looks foamy (about 5 minutes). Mix in the flour and butter using the dough hook attachment on your stand mixer (this is the first time I’ve ever used the dough hook attachment and I’ve had my Kitchenaid mixer for 4 years). Mix the dough for another 5 minutes until it pulls away from the edges of the bowl. In another large bowl, spray cooking oil all over the sides and bottom and place the dough in. Cover the bowl with plastic wrap and let it sit in a warm place for about an hour. I had just used my stove top and it was still pretty warm so I placed my dough on the cook top to rise. The next step is a technique I have never done or seen before; I had to boil the un-cooked dough before I baked it in the oven. I boiled it in a mixture of water and baking soda. While you bring the water and baking soda mixture to a boil, shape your pretzels. The people at Auntie Anne’s in the mall make this step look so easy, be warned its really not. Some of my pretzels looked more like mashed faces than twisted pretzels. A good tip though, is that you need to roll out these pretzels on a cool and smooth surface. I started rolling them out on my butcher block countertop that I had sprayed with cooking oil but it was too warm and the dough still stuck like crazy. I then tried rolling out the dough on a plastic cutting board that I had sprayed with cooking oil and the whole process was much easier and my pretzels looked more like pretzels. Notice the poor mis-shapen pretzel at the bottom left of the above picture. Once you’ve formed your pretzels and placed them on a greased sheet of parchement paper, on a baking sheet, its time to boil them. Place them in the simmering water using a wide spatula. Boil each pretzel, one at a time, for 30 seconds total but be sure and flip it over half way through (15 seconds) other wise the pretzel will not cook evenly. Use a spider to take the pretzel out of the water to avoid slipping and dropping it on the floor. When all the pretzels have been boiled, place them back onto the parchment lined baking sheets, brush on a mixture of egg yolk and water and sprinkle with coarse salt. Bake at 450 degrees for 12 minutes. Serve with a side of mustard. In the end, all the work was worth it. These pretzels were really good. For a different “twist” you could coat them pretzels with cinnamon and sugar instead of salt before baking them. I’m looking forward to trying them again and getting better at making the pretzel shape. We had some friends over for dinner the other night, which I always enjoy because I get to try out new recipes and I love to entertain. It’s a lot of work, but seeing people enjoying my food and having a nice time at my house is completely worth it for me. When entertaining, I like to try out different formats for the evening and ways in which I serve the food. Sometimes it will be family style in the middle of the table, or a buffet in the kitchen, each course served alone, inside in the formal dining room or outside on the patio. For this evening, I decided to mix things up a bit. The weather was gorgeous and a heat way had just ended, giving way to cooler air, little humidity and warm sunshine. I decided to enjoy our patio and serve appetizers and wine outside, moving inside for the main course in the dining room. I love mushrooms, all kinds in anything and everything. I think mushroom are a food that either you love or really hate. I always ask people if they like mushrooms before having them for dinner because most dishes I make have mushrooms, somewhere. These crostini are delicious and quick to put together. I also love that you can make them up to 2 days in advance and keep everything in the fridge to pull out when you’re ready to serve them. It’s OK to substitute, but make sure you’re getting 3 different varieties of mushrooms, this creates a rich earthy flavor. Start by cleaning the mushrooms with a damp paper towel, then chop off the stems and slice. Finely chop up the shallots, garlic and fresh rosemary. Heat the olive oil in a large skillet over medium heat, add shallots and cook for 1 minute. Add all the mushrooms and cook for another 6 minutes until they have released any juices and begin to brown. Stir in garlic and cook for one minute. The recipe doesn’t call for this, but I added some white wine to de-glaze the pan, about 1/4 cup, scraping the brown bits on the bottom. Take the mixture off the heat and stir in heavy cream, rosemary and lemon zest. Salt and pepper to taste. Allow the whole mixture to come to room temperature and then add in the grated cheeses. (You can store in a container in the refrigerator up to 2 days in advance). Slice up your baguette and toast in the oven at 375 degrees until golden brown, about 9 minutes or so. Top the slices with about 1 tablespoon of the mushroom mixture and place back on a baking sheet. Put under the broiler for about 3 minutes until the cheese melts, watch them carefully to avoid burning. Garnish with fresh rosemary sprigs and enjoy! Preheat broiler. 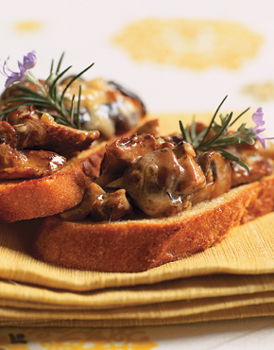 Top each toast with about 1 tablespoon mushroom topping. Place on 2 rimmed baking sheets. Working in batches, broil until cheese is melted and begins to brown, watching closely to prevent burning, about 3 minutes. Transfer to serving platter. Serve warm.